The kind of black mold that shows up in houses and buildings is directly related to a medical problem known as sick building syndrome, according to the American Industrial Hygiene Association. To remove black mold, you’ll need to figure out why the mold is there in the first place, fix that problem, and take the necessary steps to eliminate it completely. 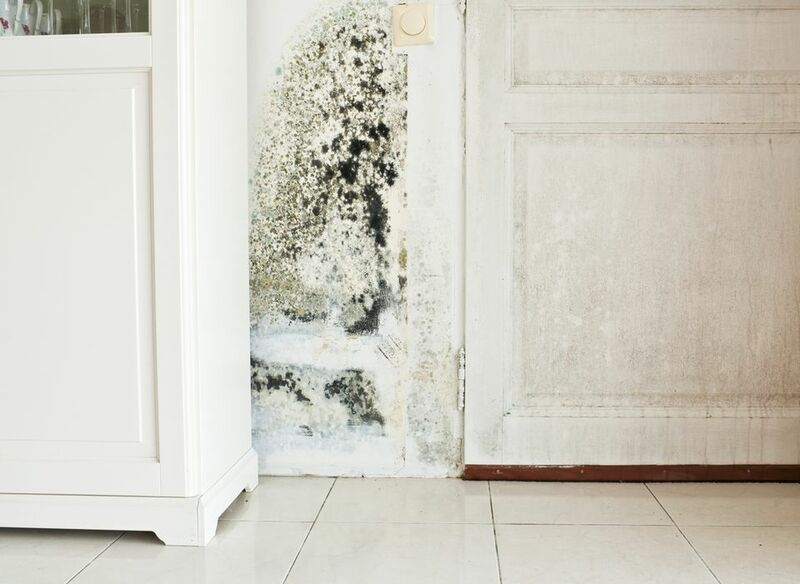 Mold grows in wet environments, so it’s important to find out where the condensation is coming from and fix the problem—whether it originates from a leak, improper ventilation, or blocked drainage. If you remove the mold without taking steps to dry up that space, it will come back. Once you fix the underlying issue, you are ready to clean up the black mold. Spray bottle with water to wet down dry areas to prevent mold spores from getting into the air. After securing the area with plastic and a fan if necessary, put on your face protection and get to work. You'll also want to cover as much of your skin as possible to prevent the mold from touching you. When closing off a room, make sure to cover both the doorways and air vents with the plastic. If possible, place the fan in a window to help vent the room. Remove any of the wet and moldy porous items from the room, including books, furniture, and mattresses. Next, cut stained or musty smelling carpet into six by eight feet squares for removal. Wet the dry, moldy areas as needed before moving them. As you remove the carpeting sections, roll them up in plastic and duct tape it shut. Turn off the power to the house before cutting into the walls. You’ll want to carefully poke a hole through damaged areas to expose electrical wires before using a saw. A screwdriver works well to expose wires. Remove any baseboards, as well, and discard them. In clearly damaged areas, cut into the drywall, taking care to avoid the now exposed electrical wiring. Cutting open the wall allows you to check the area behind it and lets the wall dry at the same time. You are looking for more than just mold. Moisture damage left unchecked will likely lead to rot. Grab the mist sprayer and wet down drywall that is obviously moldy along with the insulation under it. Double bag all material as you remove it and secure the bags tightly. Cut out any damaged wood studs and sheathing. In areas where removal is impossible, clean the wood thoroughly. Leave it exposed long enough for it to dry out and then spray it down a preservative. According to Angie’s List, you should only use an EPA-registered disinfectant cleaner on decks and fences to avoid damaging the wood. Professional mold removers often use these. If not available, fill a bucket with one quart of water and 1/2 cup bleach. Work the solution into the surface areas and then allow them to dry naturally. It may take more than one cleaning to completely remove the mold. Once you thoroughly clean all the areas, paint the wood and seal it with an oil-based primer or pigmented shellac. Prep and cover the walls with a latex paint designed to protect against mold growth.